The car is a few details away from being finished. All it requires are a few more coats of Klear and then all of the chrome external parts to be attached. I normally attach them using Gators Grip - an acrylic glue that works like super glue but can be cleaned up as it sets. I must give a round up of the final painting which proved to be more complicated than I expected. As I have discussed, I painted the car with Tamiya metallic blue which went on very well once it had been decanted from the rattle can. The next step was to add the white strips. Now the kit contains decals for all of these so it should be a simple exercise. If I had know then what I know now, I would have approached this very differently. 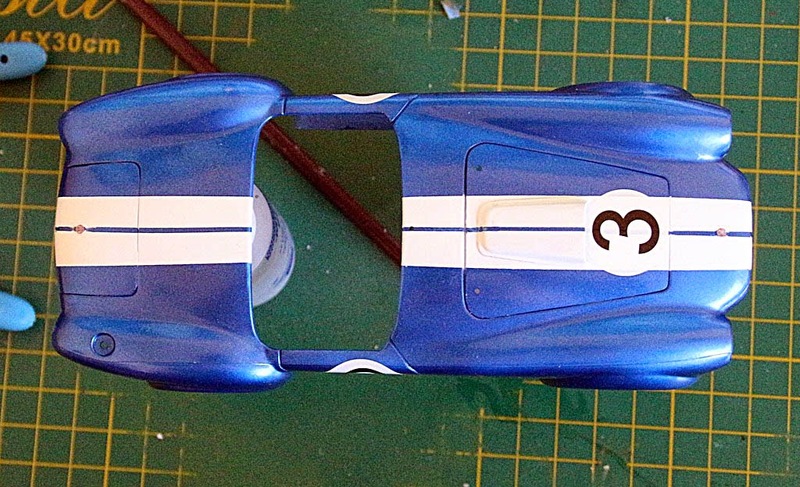 I applied the white decals but I had a similar problem to that which I had with the GT40 - namely that the decals split as I was applying them. Add to that the fact that I couldn't get the decals around the air intake on the bonnet (hood for my American friends) to settle down and things were not going well. In the end I took all of the decals off and decided to paint the white stripes. This is where the "if I knew then" bit comes in. The best way to do the stripes would have been to paint the car white in the first place and then mask out the white whilst I applied the blue. However, now is a different country from what might have been then! So, I had to mask out the blue. 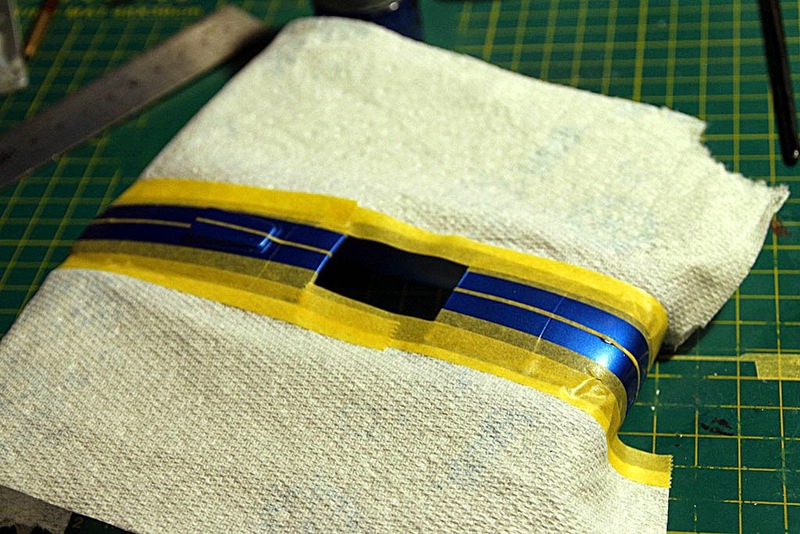 This involved cutting a very thin strip to get the separation between the two white stripes. Now you see why it should have been done first. The other way would have involved just putting two masks down for each of the stripes. Still, I managed it. Here is the car all masked up. Here is the final result, after all the painting, touching up and decal application. Irritatingly, Fujimi supply the parts to make it a racing Cobra and give you the white circles for the numbers. However, they don't supply any numbers! I had a look in the Revell Ferrari GTO that came the other day and it has two decal choices. One was for a Le Mans racer, which is what I wanted to build, whilst the other was for a race at Monthlery which wasn't of much interest. I cut off the numbers for that car and applied them to the Cobra. As mentioned earlier, if I don't show you the insides now then they won't be available once the body is on to here is a few photos as a slide show. Lastly, I thought that I had better mention why there is only one seat fitted. I have bought a set of Eduard 1/24th scale seat belts in blue. I have three sets of belts but they are all red, which wouldn't look right. So, the seat is waiting for the belts to arrive before I can fit it finally. Airbrush Woes and an old familiar story! So what went well over the years? At last, something worthwhile - and finished!